2002 52 SUZUKI GSX 600 F FK2 A Great Example, Good First Big Bike Or Commuter. Delivery Available. 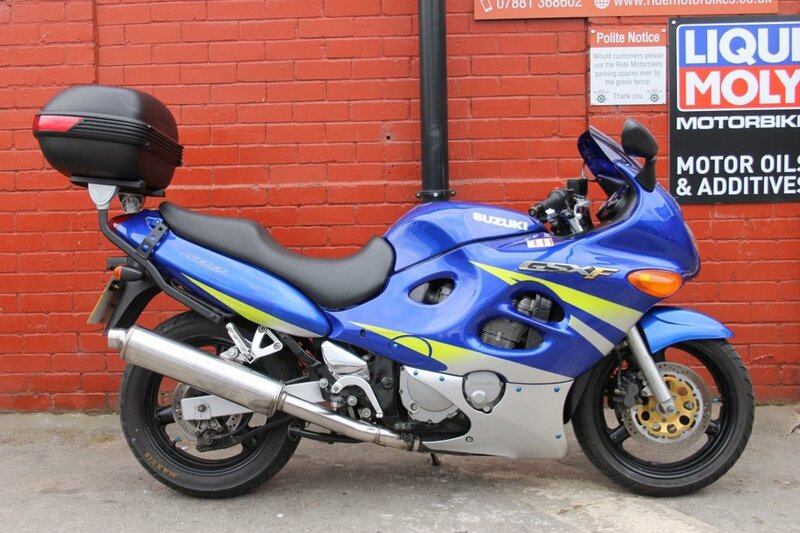 Here we have a Suzuki GSX600F in striking blue with only 15K on the clock. She is in very good order for her age and mileage, a real credit to her former owners. Credit and Debit cards accepted. UK delivery is available. She will leave us with a full PDI, service, 12mth MOT and a 3mth Ride warranty. Extended nationwide warranties are available at reasonable prices. We have all her keys, the V5 and manual but no service book. There are lots of Mot certs as well. She runs and rides spot on. Benefitting from the Givi Top Box and centre stand. Other than that a standard bike. We sell and installOxford heated grips and datatags if you wish. This would be a great first big bike or commuter. She really does stand out in this colour scheme. Ride is a friendly down to earth business with a passion for biking. Nationwide Delivery, HPI Clear, PX Welcome, Friendly Customer Service. 01535 658811. ***Check out our customer reviews on the website, at Ride Motorbikes Ltd Facebook page/Autotrader shop and google*** For more information about us, the bike and our stock please visit our website. The adventure starts here! Open 7 Days A Week Ask us about Locks and Chains, Datatags, Helmets and Heated Grips. Stay warm and secure with Ride.